Audio performances* take place every Sunday in June, July, and August of 2014. See below to see which installments will be curated and by whom. 15 – Curated by the Kitchen Sisters. More info and to reserve your spot here. 22 – Curated by Unfictional. More info and to reserve your spot here. 29 – Curated by Third Coast Audio Festival. More info and to reserve your spot here. 6 – Curated by The Moth. More info and to reserve your spot here. 20 – Curated by the Dinner Party Download. More info and to reserve your spot here. 27 – Curated by Radiotopia. More info and to reserve your spot here. 3 – Curated by Snap Judgment. More info and to reserve your spot here. 10 – Curated by The Truth. More info and to reserve your spot here. 17 – Curated by Wiretap. More info and to reserve your spot here. 24 – Curated by 360 Documentaries. More info and to reserve your spot here. Late August/early Sept (date TBD): Grand Finale playing the “best of the best” as selected by our Jury!!! * Doors at 8 pm; audio begins at sunset. All events are by donation. BYOB. This is such a wonderful idea. Is it possible for those of us who can’t get down to Big Sur to hear these stories online? hopefully! 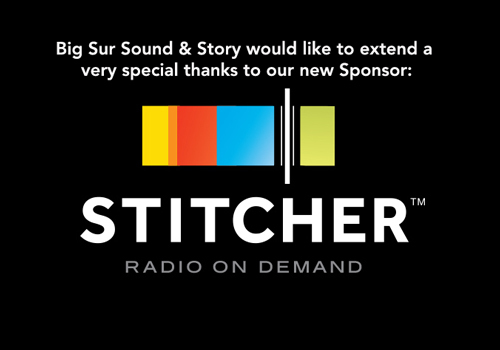 Eventually we plan to have the files hosted on stitcher.com so you can listen to them. Stay tuned!! Lastly, you can find affordable hotels in Monterey, which is a 40 minute drive. Thanks for the last response, really helpful. We couldn’t make it to any of the shows yet but now we’re back in the bay area, so still looking fw coming out for Sound & Story! When is the Grande Finale, up there it still says TBD, is it known yet when it might happen?